Happy New Year! I hope you get off to a good start for the rest of your school year in 2019. I’m starting out the year with new vocabulary task cards. These cards are similar to the ones I made a couple of years ago using 4th grade vocabulary lists. 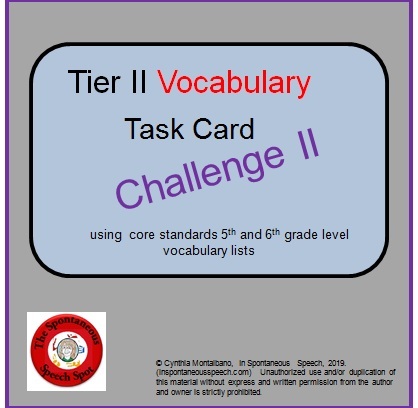 This time I used Tier II Vocabulary lists from the 5th and 6th grade levels. I used as many words as I could that made sense within the context of the paragraphs I wrote. If you make it to the bottom of this post there is a free trial set. They can also be used with older students who need supplemental help with vocabulary development. They do not have pictures that older students would find childish or refer to grade levels on the cards. There is a vocabulary list included for instructor reference. Core State Standards put a strong emphasis on vocabulary words that occur frequently in academic text. These are referred to as Tier II Vocabulary. Students come across these words when reading Science, Social Studies and English text so not knowing them can make reading and understanding academic text difficult. I am always trying to figure out how I can make the biggest impact on my students in the classroom and I think concentrating on vocabulary at the later elementary to middle school level can make a big difference with their comprehension. 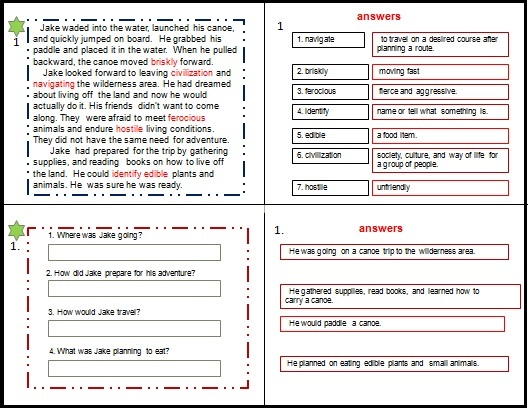 These cards use the words within short paragraphs so they address comprehension within text as well as giving context clues toward the word meanings. I am going to give you a chance to try them out with a trial deck of 10 cards. If they work for you, you might want to consider buying the full set on Teachers-Pay-Teachers. The full set has 2 sets of 16 sheets for a total of 32 sheets of task cards. There are a total of 120 vocabulary words presented on the cards. Set 2 is a duplicate of set 1 with the following differences. Set 1 has the answers on the right half but they are scrambled and the student will need to find the correct answers from the list. These are marked with Find the Answer. Set 2 has the correct answers provided on the right half and is marked as Answers. The cards are placed on the sheets so you can choose to make double backed cards. For example card two (vocabulary meanings), folded to the back, would make a good backing for the card containing the (text). You could also cut right half off and make a double backed card with the card containing (text) and the comprehension questions folded up to make the other side. You could keep all of them together and fold right half back to provide word meanings and answers to the comprehension questions on the back side. Set 1 with the mixed answers will require a student’s thought process to get an answer. 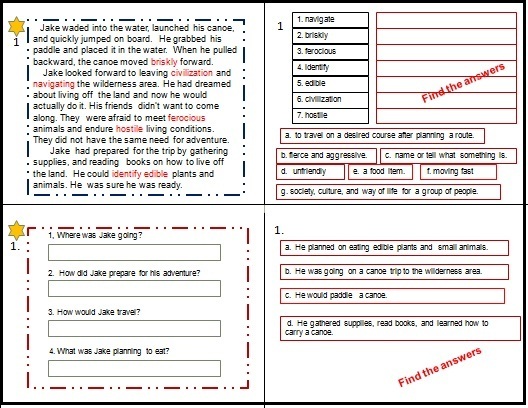 Set 2 provides answers for a flip side if you choose to make the cards part of a learning center and self checking. By making both sets I can differentiate the instruction for different needs and methods of instruction. I am going to give you a chance to try them out with a trial deck of 10 cards. I hope this helps with your return lesson planning. Just click on the colored lettering below.